Aquarius and Libra in love most often fit together like a hand in a glove. Aquarius loves innovation and friends, and Libra loves to create the balance to facilitate those elements of his or her lover’s life. Both zodiac signs are charitable and love to advocate for and create peace in the world. But both need to be mindful of their shortcomings in this Aquarius Libra compatibility, so one or the other doesn’t get put in a subjugated position. Aquarians are visionaries and admire the groundbreaking knowledge and ideas. These are intellectual innovators are usually on the cutting edge of whatever they’re working on. Librans are the scales of the zodiac; they want to create balance wherever they go. The result is that the Libra star sign will help to balance his or her Aquarian partner, so that he or she can do and achieve more! The Aquarius sun sign is definitely an innovator, but they are also the astrological sign of friends, and they are always ready to help a friend. In fact, if you need it, Aquarius will quite literally give the shirt off of his or her own back. And Libra, who is always weighing out situations and trying to balance the world, is right behind them! Unlike earth signs, this couple has no attachment to physical objects or money, which makes it all the easier for them to give. Aquarius is ruled by Uranus, which represents rebellion, and Saturn, which represents karma. And Libra is ruled by Venus, which represents love. Because of this, the Aquarius Libra soul mates seem destined to accomplish great things together. In fact, these two are made to accomplish tasks! As cardinal and fixed signs, these two star signs stay focused and follow through. The Aquarius personality brings the innovation to the mix, and the Libran brings the “stick-to-it-iveness”! Need an outline for an academic research project? Need to generate an innovative marketing strategy? 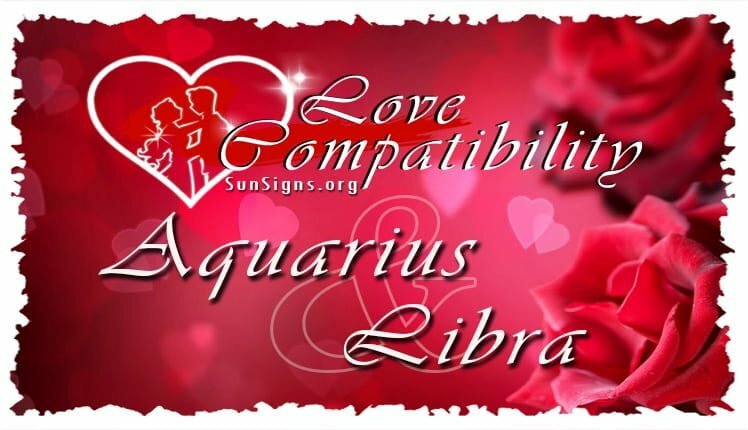 This Aquarius Libra relationship will be the right choice! Our Aquarius man or Aquarius woman will come up with the innovative ideas, and our Libra man or Libra woman will follow through with a balanced plan that will be sure to work! The Aquarius Libra friendship is quite a productive team! The Aquarius dating Libra are not jealous signs, and both allow the other to have plenty of space, if needed. Aquarius, especially, is not the clingy sort and needs plenty of time out with friends. And let me tell you, this Aquarius Libra compatibility have quite the circle of friends, too! The water bearer is the sign of friends and, boy, do they have a lot of them. And the key to being the Aquarian’s friend is not how influential you are, but how interesting you are! Aquarius may befriend janitors, senators and healers, as long as they’re original and ingenious thinkers. They love to pick the brains of interesting people. And balance-loving Libra person loves that their friends balance the scales, by coming from all walks of life! Speaking of balance, the Aquarius Libra sexually tip the scales in the bedroom definitely! The Aquarian brings the innovative ideas and Libran makes sure that there is balances stamina to last the whole night through!! Are you up for all night role-playing with the naughty maid costume? Do you want to try all of the Kama Sutra positions from easiest to hardest? With Libra’s stamina and Aquarius’ ideas, these two star signs often have marathon love making sessions that can last all night! So Aquarius, if you want to find someone who will create enough balance to facilitate your ideas and dreams, choose a Libra partner! And Libra, if you want interesting friends to visit, and a partner with never-ending innovative ideas flowing, choose an Aquarius partner! There aren’t so many negativeness with this Aquarius Libra love compatibility, per se, but important issues that these two ignore. Because Aquarius is so cerebral, it’s hard for them to focus on the banalities that often keep us clothed, fed and connected with friends. This leaves the job for conflict-loathing Libra, who will do anything to avoid a confrontation. This can be problematic for this star sign compatibility. You see, someone has to remember to pay the bills, buy toilet paper, make sure there’s sufficient food in the house and, you know, neither of you wants to do it. I’ll rephrase that, it’s not that you don’t want to do it; you’re both so busy thinking up creative and innovative ideas that you don’t have time or space for it. This Aquarius Libra marriage works out fine until the electricity and water get turned off and someone has to eat. This makes the Libra male or Libra female upset, because there’s no balance, prompting him or her to restore that balance. Here’s the problem, although Libra born is darn good at tending to these banalities, they don’t always like to do them either. They like to play as much as their Aquarian partners. However, because they don’t like conflict of any kind, they’re the ones who end up doing this work. But unlike Pisces, who will keep their mouths shut for an eternity, Libra will blow his or her stack. Because they hate confrontation, they will wait until they are at the end of their fuse, then BLAMMO!! And again, because Libra hates confrontation, they’ll feel badly after blowing up at their Aquarius lover. This builds resentment between this otherwise well suited couple leading to a Aquarius Libra breakup. There is also some trouble for the Aquarius Libra in bed as well. Aquarians have a tendency to chase after the “shiniest” person in their midst, which can lead to problems with infidelity. Librans have a much more conventional sense of fidelity and are often hurt by the water bearers flitting from person to person. Libra, because they can rationalize, will have their bouts of infidelity as well. But often times this is in direct response to their Aquarius lover’s infidelity, creating a vicious cycle. This causes abundant ill will and it may also hurt the people their chasing, too. Although they will undoubtedly remain friends, this puts a strain on the Aquarius and Libra compatibility. So, Aquarians, pay attention to your Libra lover, your home and your bills! Be self aware enough to understand that your weak points are the banalities in life, and understand that your Libra lover might mot want to partake in them either. So, either do something about it, take turns with your partner, or, better yet, hire someone to do it…just don’t forget to pay them! This will take the strain off of both of you in this Aquarius Libra love compatibility and leave you free to innovate, donate and volunteer! This will free your Libra lover to join you, rather than clean up your messes. But also Aquarius, don’t forget the most important friend in your group, your partner, and your Libra lover!